It has been the week of artists talks, openings and performances in town…. making for a very busy week in local art. I have been running all week and think I only hit about 10% of them. I think that is a good sign for the local art community. Here is week number two of the Local Art 10…I just made it in time to get it in this week. 2. Midway Contemporary’s current exhibitions: 800 Numbers — Ned Vena, Bingo, wait a minute… — Alex Hubbard and The Ground — Felix Culpa, Todd Norsten, Conny Purtill, Josh Rickards up through December 5th. Excellent lineup of exhibitions that is a can’t miss as usual. Also, make sure you check out Midway’s extensive contemporary art library on your next visit. It is one of the best resources for artists in the state. 3. The Minnesota Eye: This exhibition at the College of Visual Arts Gallery in St. Paul highlights many established and emerging photographers which call Minnesota home including Paul Shambroom, Alec Soth, Justin Newhall, JoAnn Verberg, Katherine Turczan and David Goldes. The opening reception is Saturday, October 31 from 5-8. Also of note is the related programming including a Photographer Panel Discussion moderated by Leslie Hammons, Director, Weinstein Gallery on Thursday, November 5, 6 – 8 p.m. and a gallery talk titled: Thoughts In and Around Photography Today with David E. Little, Curator and Head, Department of Photography and New Media at the Minneapolis Institute of Arts on Sunday, November 8, 4 p.m.
4. FEAST MPLS is a recurring public dinner designed to use community-driven financial support to democratically fund new and emerging artmakers. The concept By getting together and pooling money, wealth becomes a plural communal attribute. The wealth is then shared with people whose projects the community finds most the valuable to implement. Each person attending FEAST is making a cash donation on a sliding scale to receive supper and a ballot. At the end of the night, you cast a vote for which of a handful of artists’ proposals should get the evening’s proceeds. The winning proposal is funded directly from the donations collected at the door, and the grantee is asked back to present the fruits of their labor to you—the patrons—at the next FEAST dinner. 5. Lee Walton: Momentary Performances: Lee Walton’s momentary performances (presented by Bethel College and organized by Michelle Westmark) are taking place around the Twin Cities from September through November. Each performance is a simple action from daily life. Each performance site is home to a vinyl text didactic giving this action or performance a time, date, and location. 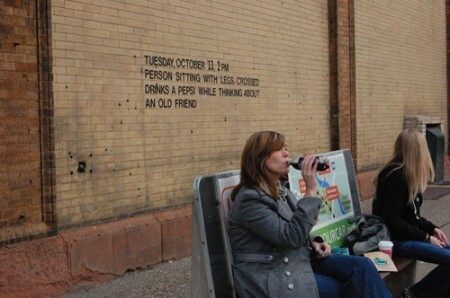 Personally, I love how the project subtly exists in the public spaces calls attention to mundane acts as performative actions. Check out Matt Olson’s nice piece on the project at his ROLU blog. You should also bookmark his blog…its well worth being on your weekly stops around the web. 6. Congrats to the new Minnesota Artists Exhibition Program (MAEP) panelists Andy Sturdevant, Megan Vossler, David Petersen and Brian Frink. A very strong addition to the exhibition review panel at the MIA. Follow the link for more details as to the program and exhibition proposals. 7. 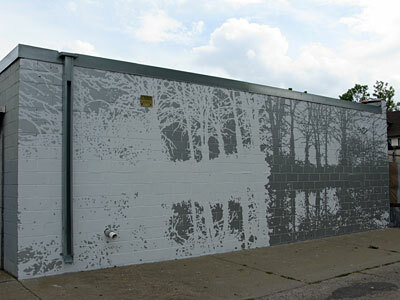 Rich Barlow: Silver Bromide Mural A very cool addition to the Powderhorn park neighborhood funded by the Powderhorn Park Neighborhood Association through a Clean City Minneapolis Graffiti Abatement Grant. Beautiful piece which changes completely in different light. 8. The Arts are well represented in a recent CNN.com list of the most stressful jobs with the least compensation. Curator checks in at number 12, membership manger at number 6, and special events coordinator (which is related to public programs and education) is at number 2. On the other side college professor is number 3 on the least stressful list….hmmm. 9. If you like these links and you are on Facebook consider joining the mnartists.org fan page. 10. The Soap Factory Haunted Basement: Okay so the Soap Factory basement is creepy to begin with…but this is so scary you need to sign a waiver. Nice. Happy Halloween.